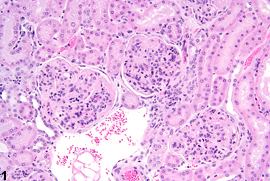 Kidney - Glomerulonephritis in a female B6C3F1 mouse from a chronic study. 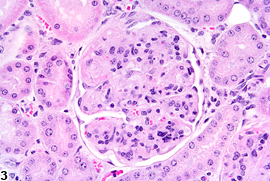 Glomerulonephritis is characterized by enlarged glomeruli with increased cellularity and mesangial expansion. 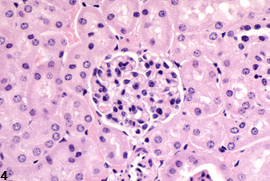 Kidney - Glomerulonephritis in a female B6C3F1 mouse from a chronic study (higher magnification of Figure 1). 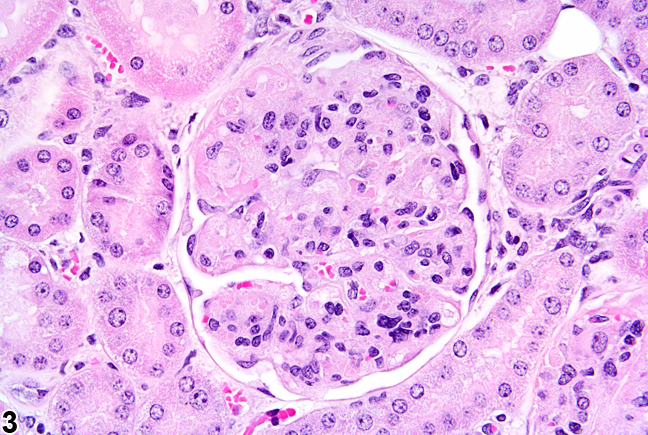 Higher magnification of glomerulonephritis in a glomerulus. 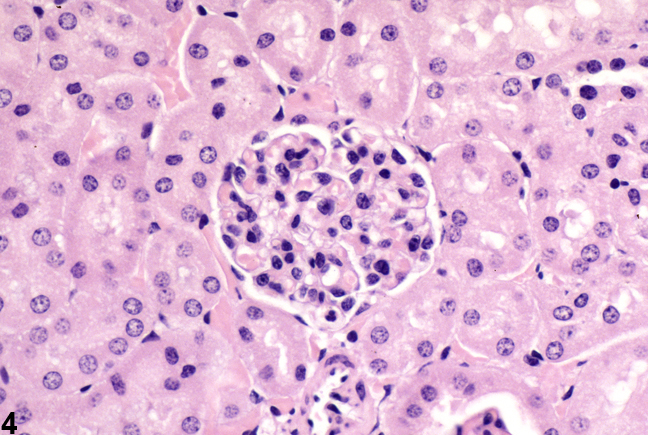 Kidney - Glomerulonephritis in a female B6C3F1 mouse from a chronic study (higher magnification of Figure 1). Higher magnification of the mesangial expansion and increased cellularity. 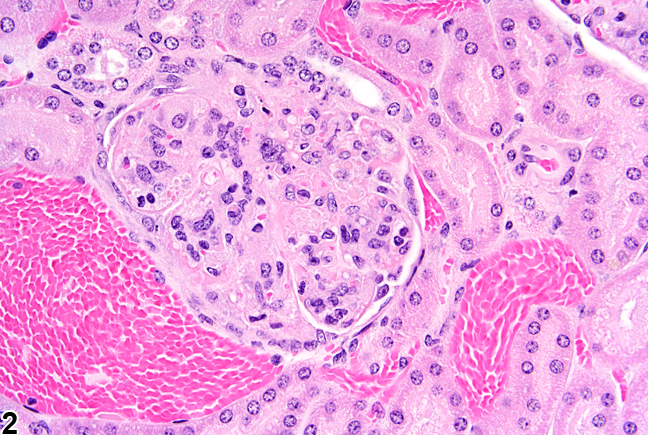 Kidney - Normal glomerulus from a female B6C3F1 mouse from a subchronic study. Compare to Figures 1-3 (magnification may not be the same as that in Figures 1-3). 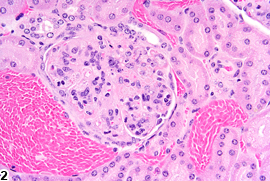 Glomerulonephritis (GN) results from acute to chronic glomerular injury resulting in glomeruli that appear enlarged and hypercellular with an increase in mesangial matrix ( Figure 1 , Figure 2 , and Figure 3 ). Primary GN is not commonly observed in routine rodent studies. There are morphologic subtypes of GN, which have certain histologic features that may indicate an underlying pathogenesis. These morphologic subtypes are often classified as proliferative, membranoproliferative, mesangioproliferative, or crescentic. Proliferative GN appears hypercellular without further identification of increased cells or basement membrane thickening. Membranoproliferative GN is characterized by basement membrane thickening, either uniform or irregular, which can be demonstrated by periodic acid-Schiff or silver stains. Mesangioproliferative GN is characterized by an increase in the number of mesangial cells. In crescentic GN, segmental areas of visceral or parietal cells form adhesions to one another and reduce Bowman’s space. In addition, modifiers such as "diffuse" and "segmental" can also be applied to further characterize the change within glomeruli. Glomerulonephritis should be diagnosed and given a severity grade. 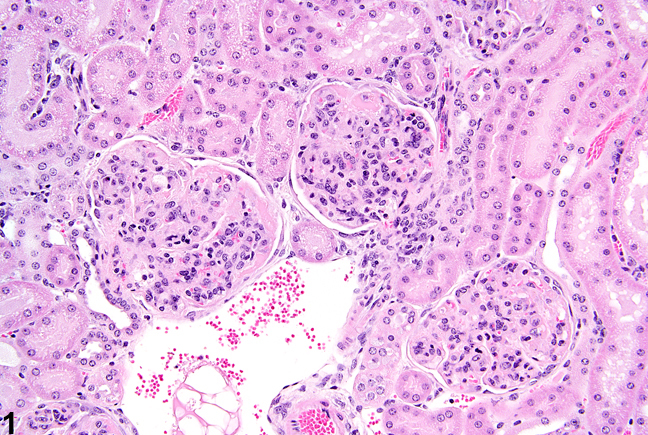 The type and extent of glomerulonephritis should be indicated in the pathology narrative. Bruijn JA, de Heer E, Hoedemaeker PJ. 1998. Immune mechanisms in injury to glomeruli and tubulointerstitial tissue. In: Monographs on Pathology of Laboratory Animals: Urinary System, 2nd ed (Jones TC, Hard GC, Mohr U, eds). Springer, Berlin, 199-224.